Every year, there’s a film that is soaked in nothing but hype. 2016 saw Suicide Squad, which critics loved to hate and 2015 gave all its Oscars to The Revenant. Admittedly, sometimes the hype is well deserved and sometimes, the film lets us down. La La Land is plastered on every billboard, every bus stop; its actors are on every talk show couch and everyone seems to think it’s the best film ever. The hype surrounding it is surreal- but is it deserved? For starters, the film is beautifully crafted, this is without a doubt. Directed by Damien Chazelle, each scene is strung together like a pearl necklace and the movie flows effortlessly. Although its labelled as a musical, La La Land won’t annoy those who dislike spontaneous bursts into song. The dancing and singing is bearable. The storyline is solid and contains a beginning, a curve, a complication and a solution. It’s a great watch- it doesn’t require much thought, the cinematography is exceptional, it’s a light, romantic film set in a modern, glossy Los Angeles about two people trying to make it big. But it’s nothing out of the ordinary. Yes, it’s a good film, but it’s no Whiplash or Birdman. It has little depth to it- things are as they seem. Several scenes give the feel of superficiality. The opening scene is one of people stuck in a heavy traffic jam, who suddenly perform a song and dance, which is left with completely no context. 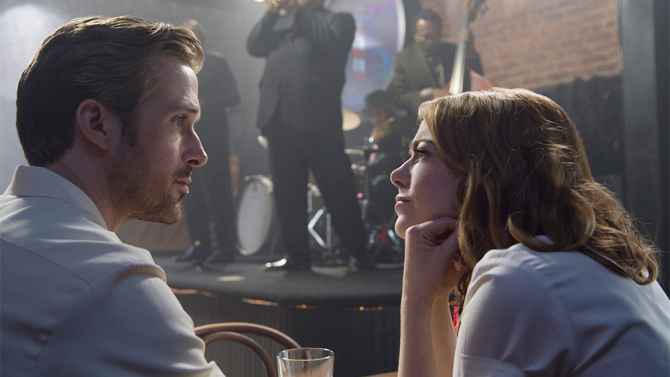 Emma Stone and Ryan Gosling do a fine job- but it isn’t spectacular. Gosling is a pianist in the film and he learned to play piano just for the role, which reflects wonderfully in the film. Stone doesn’t seem to fully grasp the role of her character- I felt like she lacked dialogue and didn’t express herself when she could have. She isn’t a great dancer either, but her skills do the job. Again, nothing out of the ordinary. It may have oodles of Oscar nominations, but I don’t think it moves mountains. As everyone who has seen the film seems to think it’s a gift from god, but it’s missing something. It just doesn’t have that spark, that unique quality, that makes a truly wonderful film memorable and a true work of art.